Hyperlounge [hyper as in hyper-text, information designed to connect you] has been a two year research project by Crowd Productions and David Poulton architects to develop ideas for that great Australian institution; the lounge room. The project's outcome is a series of nomadic media-on-demand viewing capsules for the Australian Centre for the Moving Image at Federation Square. These capsules are the first fully functioning built spaces to come from Hyperhouse, a project begun in 1990 by Crowd Productions, Cash Engineering Research and David Poulton to experiment with new ways of making space. In research conducted over the last decade with Anthony Kitchener from Cash Engineering Research we came to the conclusion that to exploit the possibilities for the design and construction of built space using new technology, time and money for research and development must be considered vital elements. 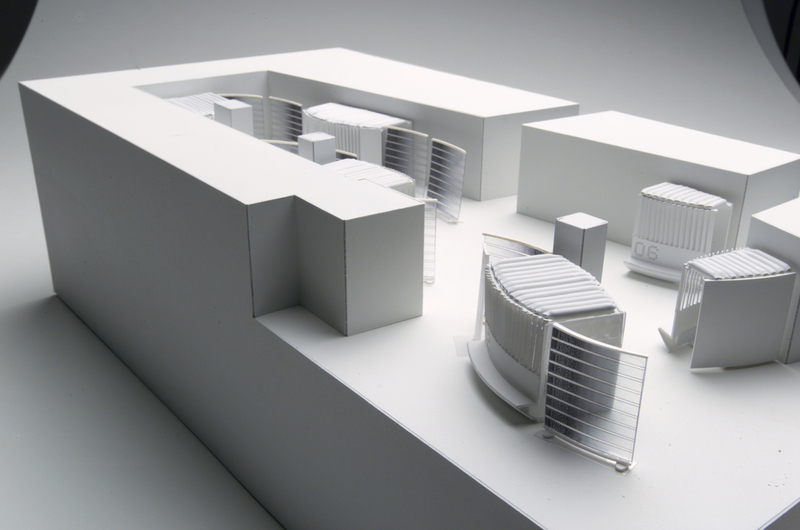 Architecture and the traditional construction industries believe they operate on a scratch-built or craft model. Architects, clients and builders pretend that each new building starts with a clean sheet of paper. This is in order to make each project authentically unique and novel, just like a piece of art or craft. In fact all today's buildings are kits of parts, and often almost identical, as a visit to any building site will attest, save for the addition of some last minute trimmings. The windows, service systems, structural members and internal and external skins are all made from modules industrially mass produced offsite by general suppliers. The builders then spend 8 months to 2 years in the rain, on a mud-covered site putting it together. This does not seem logical to us. Our response has been three fold. Firstly we accept that buildings are already made of mass produced components. So we have thought about how to exploit this fact; to make things interchangeable, upgradable and reconfigurable. How we connect the systems becomes our art. Secondly the entire building is built in a controlled environment with ideal conditions and the best machinery; in a factory. Thirdly because the first two decisions give us the optimal way of constructing and integrating diverse elements we have used this opportunity to source and construct far more technologically adventurous elements. Using this strategy we have copied the car industry construction model. However, rather than give the problems associated with new construction techniques to others to solve we have made the understanding of this technology our concern. Like the composers of contemporary Techno dance music, who use the computer to allow them to build and mix their own music, often without leaving the bedroom, we wanted to control the cost of research and development by implementing a hands on approach, experimenting with and building the new systems ourselves. This diverges significantly from contemporary architectural practice. Few architects spend time wrestling with the assembly of building components on site. In fact I'm sure it's probably illegal and anyway the image it conjures up is terribly undignified. However it seems to us that unless one has had first hand experience with the elements one is building with, you will not really know their nature and this will reduce your ability to learn and innovate. It is strange that in other disciplines from art to surgery we do not trust those who are not practitioners as well as theoreticians or concepualisers. Our desire is to fold all of the experience in developing new forms or techniques into both our design thinking and detailing to optimize its impact on our ability to respond as designers. These responses are not incidental to our designing but central and the whole process is a dynamic one. The project outlined below has been for us an experiment in designing and constructing this way. It has produced four key lessons. The process has focused us on the need to prototype and resolve all detailing before any construction. While traditional buildings are extensively drawn up prior to construction, in fact a high percentage of design detailing about the way built elements connect and are therefore visually resolved, is executed by subcontractors or the builder on site. This design component by others is only acknowledged by architects through their expression of preferences for particular builders and subcontractors. In developing buildings and building systems that do not require extensive on-site design and resolution by others a much higher level of detail design is required. The extent of this difference has taken us two years to fully appreciate. Secondly, interchangeable modular construction of components requires much greater precision. Tolerances on building sites are in the order or 10mm. These discrepancies can be 'disappeared' by the builder with extra plaster or a bigger shadow line. With only prefabricated metal components, tolerances of between 1mm and 3mm are required. Thirdly, like a car, all the real design happens at the chassis stage. It is important that everything appears to join together seamlessly and without clumsy bolts and 'afterthought' brackets. Everything needs to connect from brackets built into the chassis, so long before the building is complete every possible variation and option needs to have its connection point established and resolved on the chassis. For this you need a prototype and lots of scenario mapping. Ironically when the project is complete the chassis and all these connection points, thought and work disappear behind the finished surface. Yet the finished result can only ever be as good as the chassis. Finally in focussing on developing the design through new systems our sense of a completely determined aesthetic had to be suspended, as we had no real idea how the systems would resolve themselves. In the Hyperlounge project the blister pack wall is a case in point. To design this system of floating images with no mechanical lighting elements involved, as in no bulb structures or electrical armatures, we could only propose an imagined general outcome. 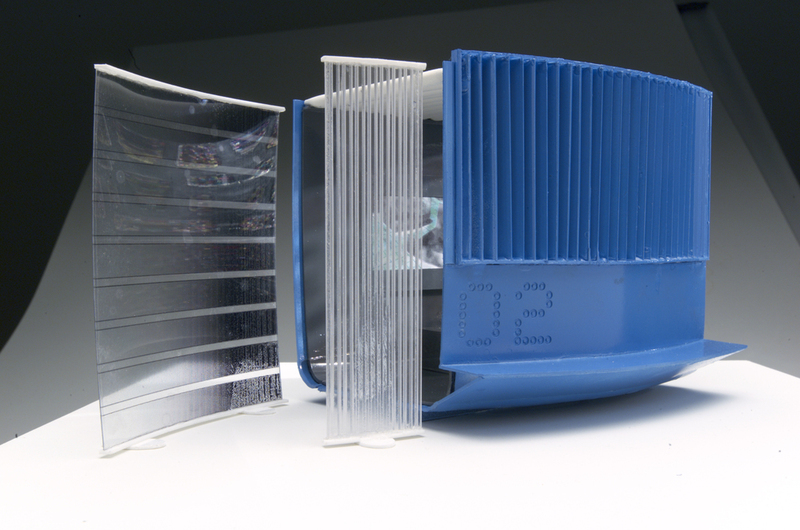 We then set about designing each individual element; acrylic containers, diffusing light guides, optic paths, connecting strategies, image medium and the clips to suspend the images and light guides within their spaces. Each element had its own team of specialists and a very long, separate problem solving path and all we could do, to hope to achieve any coherence, was to make each element as simple and minimal as possible, in the hope that some notion of economy would unify the outcome. In the end the system of parts bought its own aesthetic borne of the logic of the system and how the parts interacted. The result, while very pleasing to us, was not something we imagined other than that we thought that the ideas behind it all were relevant to the project. These lessons will now shape our design strategy for the next project in this series, the design of a private house on a highly sensitive rainforest site on the Queensland coast, to be completely constructed off-site. 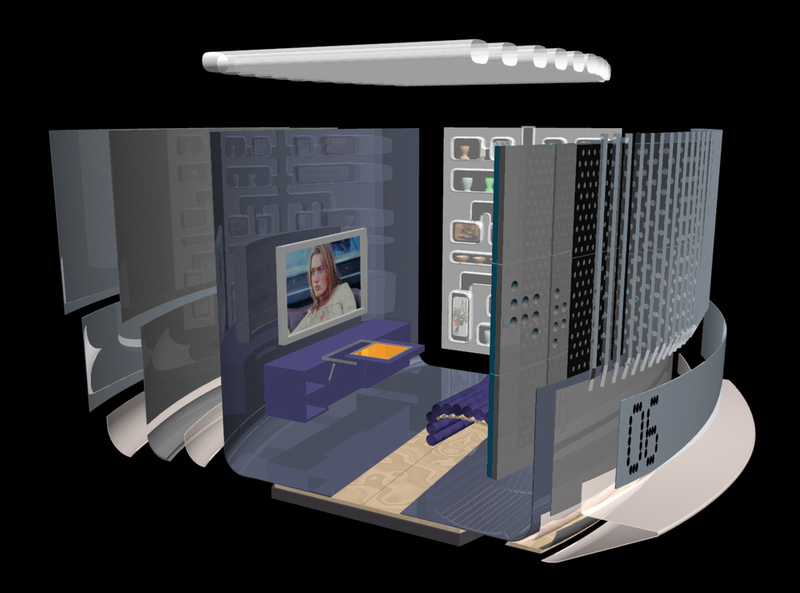 In 2001 the Australian Center of the Moving image asked us to design a mass-producible 'lounge room of the future' for their Federation Square exhibition complex. To design and build functioning spaces that explore the possibilities open to us rather than replicate existing templates required a combination of research, conceptualizing and an ability to follow through to reliable operational outcomes. This project to design Screen Lounges for ACMI was the perfect test of our 'Techno-architectural' proposition and our Hyperhouse research. The Screen Lounges are micro lounge rooms designed to bring the domestic experience of television into the range of experiences at ACMI. They are intended to provide a high level of viewing and listening experience, somewhat like a home theatre experience, a concert hall for home, a little opera box. They provide access to a range of screen-based content; short films, television programs, new media works from the ACMI collection and computer games. Each capsule has a 42 inch plasma display screen and a 17 inch control screen. Our homes and particularly our lounges are increasingly places designed for accessing information and connecting. They are becoming interfaces and filters for experience, extended social contact and entertainment. The range of experiences the world offers us is no longer described by our immediate neighborhood and is not satisfactorily framed by our windows and doors. We need other, more dynamic points of connection. In imagining the Hyperlounge we were keen to emphasise the idea of the flow of data and energy through space to the surrounding environment and vice versa, to create curiosity, using surfaces that wrap around the spaces but do not isolate them. Drawing from the vocabulary of video and film production we have worked to design an exterior skin that reflects this character, alluding to scanning, sampling and the jump cut, to create a discontinuous and fragmented porous surface that suggests the voyeuristic and participatory nature of television. We also see this discontinuous nature as being reminiscent of the experience of the city. The principal wall of the capsules consists of three layers. 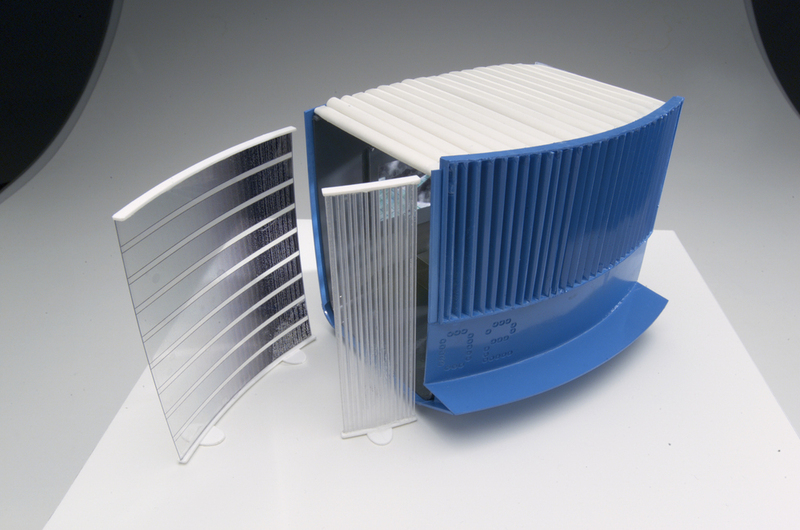 The outer surface of the wall is louvered to break down the solidity of the surface. Behind the louvers is a black mesh grill. 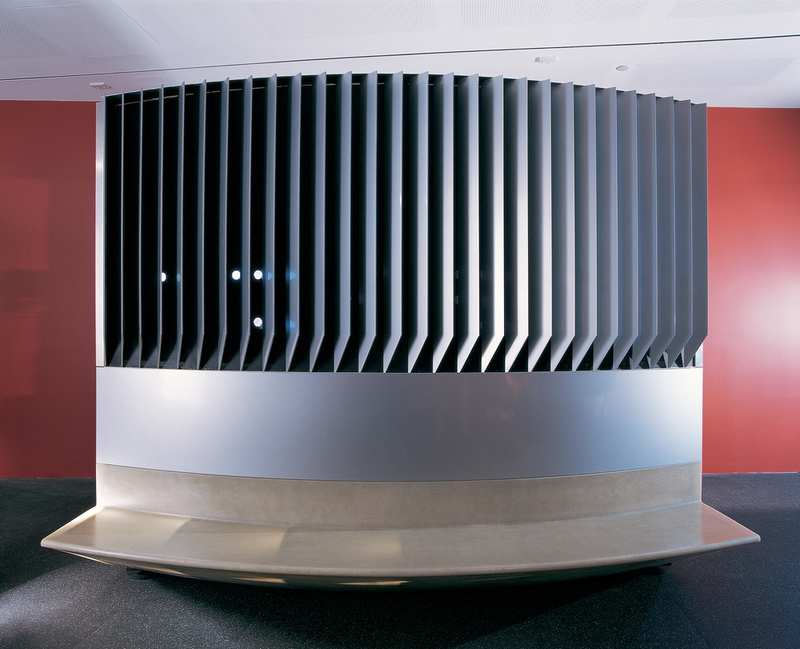 The louvers offer the illusion that the interior can readily be glimpsed, an invitation to voyeurism. The inner surface of the louvers is mirrored so as to reflect and distort any image that does present itself from the interior. This amplifies a sense of activity from within while further fragmenting it. The passer by, in motion, glimpses the peepholes discontinuously, in a row interrupted by the screening rhythm of the outer vertical louvers. The pattern of the peepholes spells out words in the Braille alphabet. This apparatus acts like a Zoetrope, the early hand held mechanical forerunner to cinema, creating a strange slightly suspended sequence of fragmentary images. From within, the view of the outside is also distorted and fragmented by the louvers. Architecturally, the shuttered, latticed, slatted, screened and fretworked envelopes of the lightweight timber houses of tropical Queensland provided us with the model of this indeterminate, layered and porous skin. 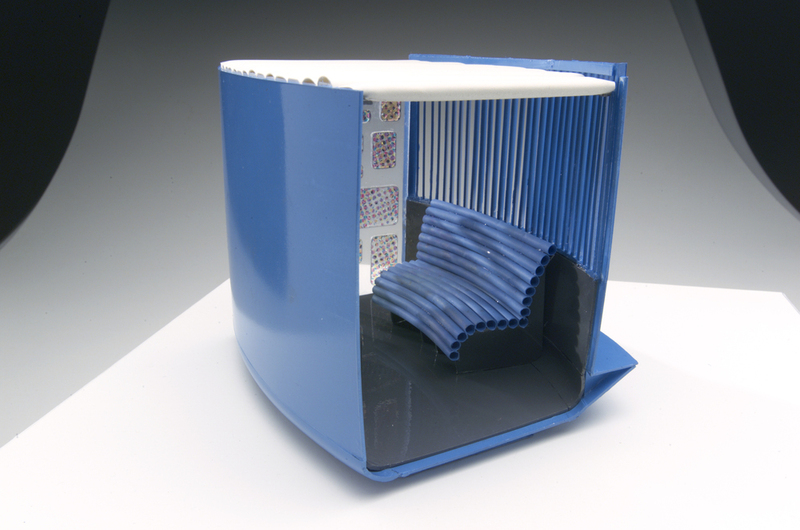 The louvered skin wraps around under the capsule in the form of an external translucent fiberglass seat. 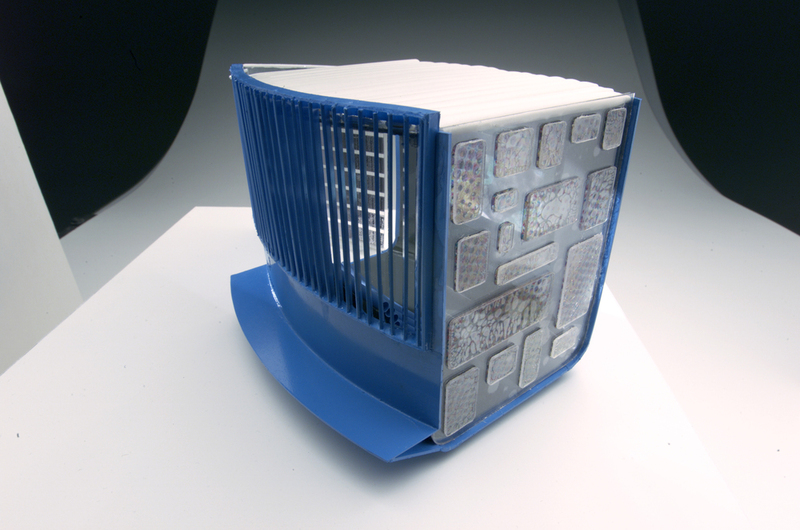 This fiberglass material is the same material used to construct or support the front colour coded bumper of your car. To create the sense of a domestic, informal intimacy within and around these Hyperlounges we made one of the walls a giant transparent blister pack, like those used to package children's toys. This holds a series of images, details taken from personal photographs supplied from the 'family' of collaborators and fabricators who have contributed to the creation and history of the project. This collection of fragments, intimate yet ambiguous, is designed to read like a mosaic wall, inviting a participatory and involved viewing. As a source image we were constantly drawn to one of our early reference photographs of images cemented into a wall in family home in a Moroccan village. Here the images appear to be worn down and frayed, expressing the idea of use, even if that use is an emotional one not a physical one. The blister pack wall of domestic memories is designed to evoke the idea of our own histories and stories that we celebrate in our homes, the very thing that makes our own domestic spaces home. The Memory Wall has been designed to employ contemporary media and eventually take moving digital images as well as still images. The fibre optic lighting system linking the images is reminiscent of an organic living form and the idea of a family tree. The construction of the capsules is based on contemporary car construction techniques. The car is the traditional way Australians connect with each other and to our places of escape and entertainment. We wanted to maintain a link to this tradition. We think of these Hyperlounges as taxis that navigate you to and connect you with virtual worlds. We have made the capsules modular and able to be pulled apart in sections for easy relocation or storage and to allow them to be put together in different ways to suit different exhibition requirements as they arise. We have designed them with a chassis that locks onto a transport system so they can easily be moved around. The ceiling has been fabricated as an inflatable pillow, translucent to let in light but also to defract it to avoid point reflections off the plasma television monitor. The inflatable ceiling is acoustically insulating and physically very light. These ceilings have been engineered by one of the world's foremost inflatable-structures engineering firms, Tensys, based in London. The seating in the Screen Lounges is inspired by the very informal way Australians use their living spaces. The seating curves around so that the viewers form part of a circle includes all of them and the television screen. We wanted to emphasize the importance of the social aspect involved in viewing television and media. We wanted people to talk about and discuss what they are seeing with each other. The seats are upholstered with Soonas, a cross between the very informal bean bag and a Doona that you might wrap around yourself while sitting up to watch TV. The Soonas can be folded into different profiles to suite different sitting styles and body types. The complex digital communication technology inside each capsule is contained in the Mantle Piece/Technology Boot or Mantle Boot. We wanted the technology to present a domestic face. It is clear from our research that with the rise of ever more home entertainment technology every home will soon need a Mantle Boot. The control unit for all of this technology is an LCD control screen. This screen is conveniently stored inside the Mantle Boot and pulls out on a mechanical arm that can extend and rotate for easy access to any seated user. We have designed a family of free standing partition screens to help create a soft boundary between the Screen Lounges and the surrounding public space. These partitions act as a kind of interior street sign system, directing traffic around the spaces. The woven partition screen or Navigation Partition Screen draws its form from the Micronesian navigators who wove their maps. These maps guided them to and connected them with their desired destinations. The Micronesians saw all knowledge as being like travelling "between parts of a matrix". This woven form also echoes the navigation interface developed by Jane Ellery on the Screen Lounge control screen. The Micronesian's need for precise directions to guide them in their journeys across vast oceans reflects a similar need for us today for guidance and navigational aids through the vast matrix of contemporary media now available. The woven Navigation Partition Screen has been created by one of AustraliaÕs foremost and celebrated weavers, Wendy Golden. The client for the Screen Lounge project was the Australian Centre for the Moving Image at Federation Square, Melbourne AustraliaThe Hyperhouse research program formed the basis for the design and fabrication response by Crowd Productions and David Poulton architects. This program is conducted in conjunction with Anthony Kitchener from Cash Engineering Research and is ongoing. The media platform architecture for the ACMI Screen Lounge progect was designed and installed by PIVoD Technologies.